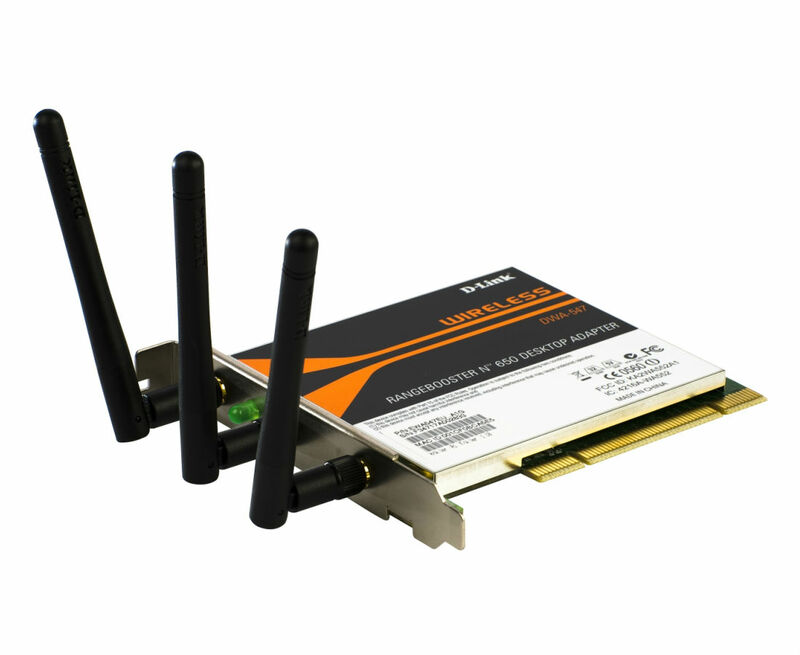 The DWA-547 Wireless N PCI adapter is a 802.11n client device that delivers unrivalled wireless performance to the desktop PC. This adapter enables users to easily upgrade to the next generation of wireless technology and access their high-speed Internet connection while sharing photos, files, music, video, printers and storage. The entire Internet experience is therefore enhanced with a faster wireless connection and flawless digital phone calls, gaming, downloading and video streaming. Complete efficiency - improve desktop wireless connectivity by 650% compared to existing Wireless G devices. High performance - superior coverage throughout your entire home and less flatspots. Total simplicity - get up and running in minutes with D-Links Click'n Connect easy to set-up wizard. Powered by Wireless N technology, this adapter provides wireless coverage that is up to 5 times farther reaching than 802.11g1 technology. With raw data throughputs of up to 300Mbps, this high performance wireless adapter is designed for use in bigger homes and for users that demand higher networking performance. Wireless performance will be maximized by connecting this adapter to a Wireless N router or Access Point so you can stay connected from virtually anywhere in your home1. It can also be used with 802.11g and 802.11b wireless networks to enable significantly improved reception1. This adapter supports WPA/WPA2 security and WEP data encryption to help prevent outside intrusion and protect personal information. A Quick Setup Wizard guides users step-by-step in their own language through the installation process, allowing them to configure this adapter without having to call a networking expert for help. The Wireless Manager is included with this product to keep track of all of the most frequently accessed networks. With unrivalled wireless performance, reception and security, this adapter is the best choice for easily adding or upgrading wireless connectivity to desktop computers. 1 Maximum wireless signal rate derived from IEEE standard 802.11g and draft 802.11n specifications. 802.11n speeds obtainable when operating with Wireless N products. Actual data throughput will vary. Network conditions and environmental factors, including volume of network traffic, building materials and construction lower actual data throughput rate. Environmental factors will adversely affect wireless signal range.